This yoga sequence is perfect for beginner to intermediate students to energize the body and lift your spirits. It also includes a few simple postures to release tension in the shoulders and open across the chest. Before you begin the sequence, salute the sun with three to five of your favorite Sun Salutations. From Downward-Facing Dog, step your right foot forward between your hands. From the Low Lunge, take a deep inhale, and lift your arms over your head for a High Crescent Lunge. Make sure your ankle is beneath your knee. Keeping the shoulders relaxed, draw your hands behind your hips and interlace your fingers. Stay in this High Lunge Variation for 3 breaths. Release and repeat on the other side. Step forward and spin your back heel down, arms open in line with your shoulders. On the inhale, begin to lift your top arm to the sky and rest your back arm on your leg. Inhale and exhale for 3 to 5 breaths as you feel your waist and side expand with each breath. Remember to relax the shoulders and keep the spine long. Keeping the same foot pattern as Reverse Warrior, release the top forearm and rest it on the front thigh. Lift the back arm over your head, palm facing down while keeping the shoulders relaxed. Hold for 3 to 5 breaths. 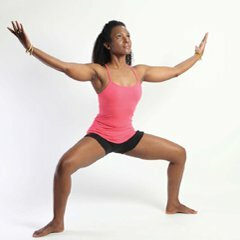 If you are feeling playful, you can flow back and forth with the breath by moving from Reverse Warrior into Side Angle. Repeat on the other side. Stand with both legs straight and turn your feet out at an angle (towards the corners of your mat). Take a deep inhale, and as you exhale, bend your knees and lift your arms and heart to the sky. Draw your belly in and send your tailbone down. Hold for 5 breaths. Returning to Downward-Facing Dog, step the right foot between your hands, the front knee over the heel. Slowly lower the back knee to the floor, gently stretching the thigh and groin. Release the top of the foot to the floor, and slowly lift your chest and arms (arms frame the head). Keep the shoulders relaxed and the shoulder blades drawing together on your back. Lift your gaze and take 5 breaths, then switch to the other side. Lower onto your belly and slide the forearms forward so your elbows align under the shoulders. Lengthen your lower back by drawing the tailbone toward your heels. As you press the forearms firmly onto the floor, relax your shoulders away from your ears, keep your chin parallel to the floor, and reach actively through your toes. Finally, draw the space below your navel away from the floor and towards your lower back. Take 5 to 8 breaths. Resting on your belly, bring your forehead to the floor and interlace your hands behind your lower back. On the inhale, slowly lift your head, shoulders and legs. Rotate your thighs inward and firm your buttocks, while you gaze slightly forward. Keep the neck long and the shoulders drawing away from your ears. Take 5 breaths, and repeat 2 to 3 times. Place a rolled blanket or pillow on the floor. While sitting in a kneeling posture, bring your big toes together and open your knees wide. Draw the blanket in between the knees then lower the torso onto the blanket. Release the arms alongside your body. Rest the hips heavy on the heels, lengthen the tailbone away from your back, and relax the shoulder and forehead. Breathe and rest comfortably for 2 to 4 minutes. I hope these poses help you expand your heart space, and help you become more receptive and eager to love!